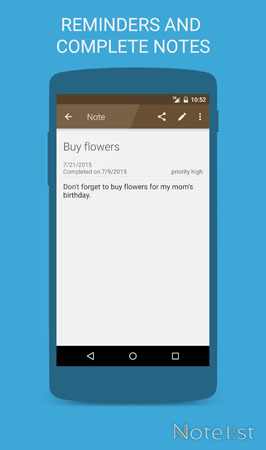 You can also use Note list to create reminders and todo items. With the reminder function you can add a reminder to any of your notes or todo items, Note list will then trigger an alarm on the set date and time. The app will display the status of your reminders in the Notes overview screen. The status can either be, reminder set, due date expired or a completed status. You can use the reminders option in combination with the calendar screen and synchronization function in the app to increase your productivity on all of your Android devices.